23/06/2015 - In line with the international movement towards more transparency and exchange of information, Mauritius has taken a significant step to enhance its exchange of information legal framework and has signed the Multilateral Convention on Mutual Administrative Assistance in Tax Matters. It is the seventh member of the African Tax Administration Forum to join the Convention and becomes the 87th jurisdiction participating to this truly global instrument to fight international tax avoidance and evasion. 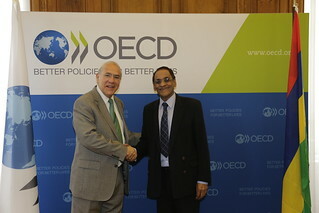 Mr. Vishnu Lutchmeenaraidoo, Minister of Finance and Economic Development signed the Convention in the presence of the OECD Secretary-General Angel Gurría [read the opening remarks]. Developed by the OECD and the Council of Europe, the Convention provides a comprehensive multilateral framework for the exchange of information and assistance in tax collection. Its coverage includes administrative assistance between tax authorities for information exchange including automatic exchange, simultaneous tax examinations and assistance in the collection of tax debts. On 24 October 2014, Mauritius was among the first 51 jurisdictions (the early adopters), which signed a multilateral competent authority agreement to automatically exchange on financial account information (the new international standard) based on Article 6 of the Multilateral Convention. Subsequent signatures of the agreement bring the total number of jurisdictions to 61. Mauritius has committed to start exchanging automatically in 2017 and now has joined the legal instrument which once ratified serves as the basis for the implementation of the multilateral competent authority agreement already signed. Mauritius has been very active in ensuring effective implementation of international standards of transparency and exchange of information which is also evidenced by its long standing commitment to implementing the standards. It is a member of the Global Forum on Transparency and Exchange of information and the 2014 peer review of Mauritius concluded that it is largely Compliant with the standard of exchange of information on request. During his presence at the OECD, Minister Lutchmeenaraidoo also met with the Director of the Development Centre, Mario Pezzini, and his senior staff to discuss the fruitful ongoing cooperation and possible future areas of work between Mauritius and the Development Centre. Mauritius has been a member of the Centre since 2009. For more information, journalists should contact Pascal Saint-Amans, Director of the OECD’s Centre for Tax Policy and Administration (CTPA) on + 33 6 26 30 49 23, Grace Perez-Navarro, Deputy Director of the CTPA on +33 1 45 24 18 80, or the OECD Media Office on +33 1 45 24 97 00.